Next up is proof of concept for Next Thing. Keep up, because this is cool! Imagine you’re a wired system installer (alarm, network, surveillance, automation, lighting, radio, audio) dealing with too many cables snaking across your wiring panel. You could do the normal, put a bunch of wire-tie holders on the board, then repeatedly close and cut and replace ties until the final configuration is set. Or,…. Instead, you visit the web site 4CELNK.com (placeholder now), sign into your account, and use the graphical interface to configure customized wiring harness holders. You select double-stick foam backs for some, screw-hole backs for others, with the cool snap-apart inserts between modules. You select a few wiring channels for your configuration needs, set the bail sizes for each, enter your PayPal info, and click Buy. The config information goes to Fusion, which puts together the requested–SIZE PARAMETERIZED!–modules in a 3d printable module. 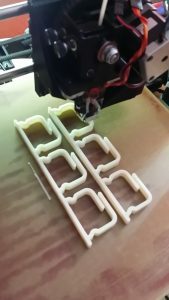 After human approval of the resulting design, that goes to the printer, and about 7 minutes per module later, off comes a fully customized wiring harness holder. A couple days later, your custom modules arrive, you stick them up, and go through the wiring exercise with amazing speed and EASE. Adding wires is as easy as sliding them into the bails. Same with getting them out. A day, a week, a month later, you can come back and change the wiring without having to cut twist ties or any of the issues associated with them. Are you a renter and want to tidy up your wires too? Well, the same modules with that 3M Command Adhesive will let you do the same thing across walls, furniture, all the surfaces where your wires could be more well-mannered. I don’t know what the current euphemism for “effing amazing” is, but this qualifies! The photos are, of course, NOT the systems imagined. 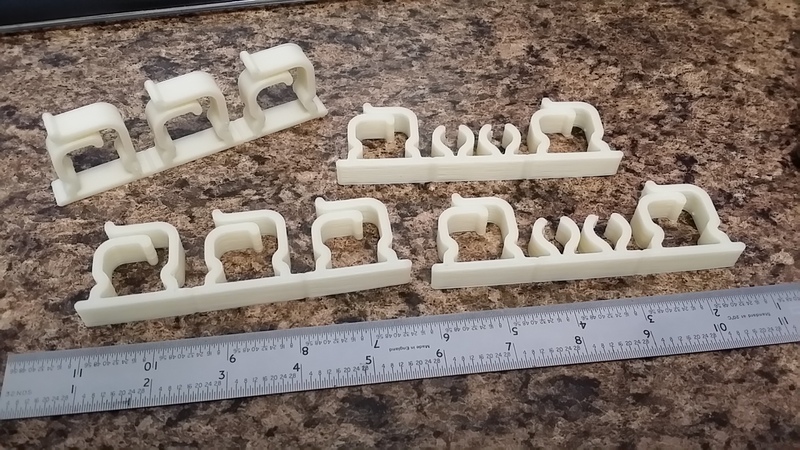 But, the parameterization, output, and zero-modifications later produce the shown printed part, is pretty cool. Note, the Fusion screenshot is not the one being printed. As further evidence, here are a bunch that were parameterized, that could be set in motion via web site or app user interaction, with near complete automation. If you think it’s impossible, the check these goodies out. 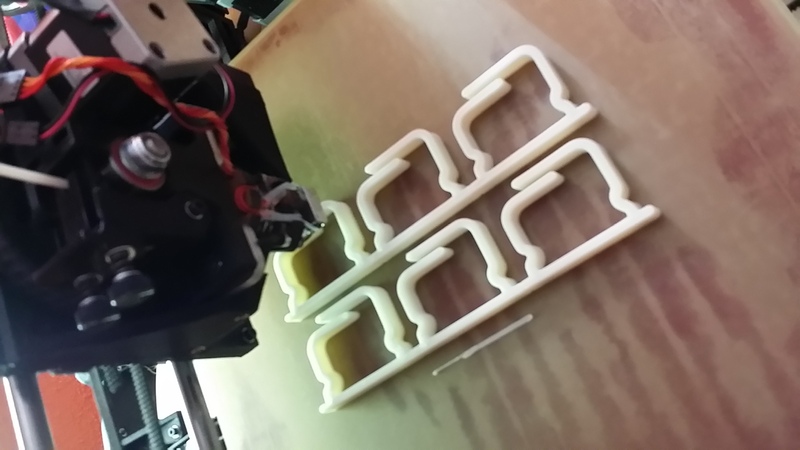 First print success, zero manual design intervention once the design was parameterized. You can even just make out the little breakaway separator junctions between the sections.